“Coming Soon” to a Blackboard Near You! 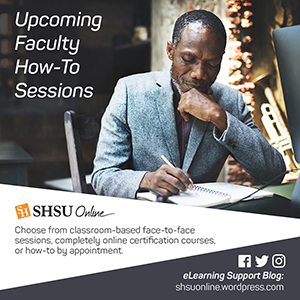 If announcements for new Blackboard tools were like movie trailers, then you’d be on the edge of your seat for these tools “coming soon” to Blackboard and SHSU Online. ….In a world where it is hard to know whether your course materials are accessible or if your students can open or understand course files, a new tool will rise. Ally, making course content accessible!…. The Ally software is designed to automatically check course materials for accessibility as they are uploaded to Blackboard. If a PDF file is uploaded, for instance, the tool will look for corresponding file tags that can be picked up by screen-readers. If tags are not associated with the PDF, the system will prompt the faculty to include them to improve the accessibility rating, and will guide them through the process via an easy-to-use interface. Part of the remarkable technological capabilities of Ally is that it can take a document, like a syllabus or a study guide, and render alternate versions of it that will play better with accessibility tools. For example, when an instructor uploads a syllabus to a Blackboard course, Ally will create alternate formats of that syllabus, including semantic HTML, tagged PDF, audio, and electronic braille. What’s more, Ally will create these alternate formats without additional input requirements from the professor. …..In a world where PDF or PowerPoint lectures are bringing you down and reading student submissions is making your eyes go dry, one tool can make the difference…..Voicethread for Blackboard. With VoiceThread, instructors and/or students can create, share, and comment on images, Microsoft PowerPoint presentations, videos, audio files, documents, and PDFs, using microphone, webcam, text, phone, and audio-file upload. For SHSU Online, VoiceThread will be an external tool that integrates into Blackboard. Both of these tools will be available soon. Be on the lookout for more information from SHSU Online!